“Can we have some nails?” my oldest asked me last weekend. It was an opportunity to teach them a new skill – hammering a nail. My husband showed them how to do it, found enough hammers and let them loose with their project. The preschooler quickly got frustrated with crooked nails. The oldest hit her finger with the hammer and cried a bit. But another one kept at it and created four wooden structures that afternoon. 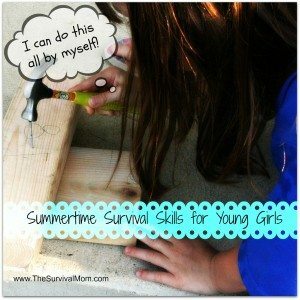 My children are young (8 and younger), but I am forcing myself to look at what they can do this summer instead of what they’re too young to do. I would like to keep them little forever, but they need to have skills to survive in this world. I realized my oldest hasn’t been taught to even use a hand can opener! I will be changing that this summer. I would hate to have them ill prepared if an emergency situation arose. They have taken swimming lessons and we have taught them our address and phone number, how to call 911 and how to recognize if someone is choking, but there is so much more to learn! I am putting together a list of things I can teach them this summer. We will use all the resources available in our area – backyard fire pit, campgrounds, YouTube videos, rainy, boring days and classes offered by our local parks and recreation department. This is the start of my list – what would you add? If you live near a Home Depot or Lowes, I’d check out their children’s classes – usually offered on Saturday mornings, FREE, and they’ll learn how to hammer nails, follow directions, and put together a project. Sometimes involves painting, glueing and using screwdrivers. One of the stores offers online registration, but I forget which one. If you have an REI store near you, check for their schedule of classes. They offer a huge variety for adults and kids. I’ve seen family friendly/kid friendly hiking classes for only $10 and I’ve seen “learn to kayak” and “learn to standup paddleboard” as well as bicycling classes. They have outdoor survival style classes that your kids might really enjoy, too. Fun for the summer!